What has their impact been? Chris Cartoudis has been the heartbeat of the Greek School of Apostolos Andreas for a period now spanning into its sixth decade. He has been teaching Greek continuously in Birmingham since 1961. His style of leadership and teaching has resulted in the development of a number of schools that have further influenced a social and cultural network, where education and excellence in Greek learning and teaching are synonymous with his name. Chris Cartoudis has effortlessly, over the years, been able to adapt with a changing environment and demographic. He has embraced integration which has allowed mixed race and non-Greek children to benefit from the Greek teaching. The fact that learning in this environment is an extra-curricular activity for all of the children is something not lost on him. His success in bringing GCE, GCSE and A-Level examinations to the school, as an examination centre, was fuelled by his passion to ensure that the children are offered a safe and familiar environment for these examinations. This resulted in an increase in student numbers attaining these qualifications. Whilst his commitment to the school and its learning and teaching is unquestioned, that commitment when brought to the test was demonstrated fully when returning to his role a mere six weeks after serious open heart surgery. Put simply, the school is his life. He encourages the school to be a centre for the wider community. He champions charitable donations to ensure that the school is open to learning and teaching to all. His passion is undiminished even as he approaches his ninetieth year. How wide is their influence? Chris Cartoudis has taught Greek to the wider community of Birmingham and the Midlands. He has taught three generations. There are many situations where grandparents exchange stories of being taught by the same person as their grandchildren. Such is his passion that he has given up many evenings to reach families across the Midlands who were unable to attend Greek school on a Saturday, teaching them Greek at home or even in the back of their parents’ shops. His influence reaches every Greek school in the Midlands, which in 1961 consisted of just one school at the centre of Birmingham. There is now a network which boasts in excess of 12 Greek schools. His reputation, however, is legendary and reaches and touches schools worldwide. You will see evidence of this in the referral letters attached. Chris Cartoudis has ensured that by keeping education at the centre of the community, the future lifeblood of generations to come is safeguarded. He recognised early the need to be responsive to change. At the time when he first joined the Greek school in the early 1960’s most of his pupils were first generation immigrants. He taught them Greek as a first language and the ability to integrate within the wider society. He then had to evolve his teaching to new learning needs of each stage of development to the position where we are now. That position is one where pupils are often third generation immigrants and Greek is a second language, and often the second language of their parents also. This adaptability has been something that he has had to impress upon the new teachers that fall under his mentoring. Many of those would often have Greek as a first language and would need to be educated themselves to the linguistic and cultural challenges that face the pupils of the time. At every stage Chris Cartoudis has been that very person to help them achieve their aims and objectives. 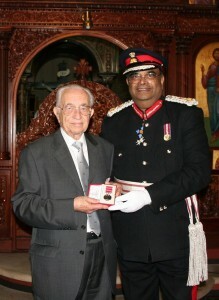 He has attained a standard for the Greek School of Apostolos Andreas in Birmingham that is synonymous with excellence. He has maintained that standard through continuing improvement to the structure and offering of the school. He identified the need and benefit of establishing the Greek school as an Examination Centre from GCE, then GCSE and A-Level examinations, firstly with The London Examination Board and more recently with Edexcel. The benefits have been immeasurable from the hard statistical data that shows consistently high pass and attainment rates, to the invisible subjective benefits of an examination environment that is familiar for the pupils, recognising that the one will complement the other. The Greek school has recognised that it is open to anyone. Chris Cartoudis has ensured that teaching will be made available to anyone who wants to learn Greek. Irrespective of financial, social or cultural backgrounds, the opportunity to learn Greek to a high standard and a feeling of belonging is always open. There is no barrier if there is an appetite to learn. He has ensured that parents with financial difficulties can obtain a place for their children, financed through bursaries made up of charitable donations from various parts of the community. He also has introduced a system where parents are invited to bring their children for a period that allows their child to acclimatise and experience the school, before they are required to make a commitment. This is another typical area of innovation that has removed any potential barrier to entry of the school. It is constantly on Chris Cartoudis mind that a parent not only will be making a financial sacrifice, but a sacrifice of both the parents’ and pupils’ spare time. By placing the Greek School at the epicentre of the Community, he has guaranteed that all facets of cultural, spiritual and social aspects of the heritage of The Community are taught, understood and maintained. The passing from generation to generation of these values and traditions is a process that has been successful over subsequent years and decades. What has also been important is that whilst children of the Greek Orthodox Community are taught about their heritage, they are nurtured to value and respect the history and culture of their parents’ or grandparents’ adopted homeland, which is now theirs also. It is important to understand that integration is not just a byword and we are expected to contribute to our wider community as well as our cultural one. This is a value that a whole community holds, which has in some respects been influenced by its greatest champion, Chris Cartoudis. Chris Cartoudis has influenced in an exceptional and exclusive way that is probably matchless on a worldwide scale. He has taught three generations of not one, but many families and there have been many situations where grandparents exchange memories and experience of being taught by Mr Cartoudis. This fond exchange of memories is not only with their childhood cohort, but that of their children and their grandchildren. The best epitaph that we can put in this submission is the fond reference that was overheard from the current GCSE intake of pupils, on hearing that their class was going to being taught by Mr Cartoudis. They proclaimed that they were to be taught by “The Legend”.